While most phones, in general, are pretty good at securely removing your data when you're done with the device. There are still some measures you need to take to protect yourself before you pass the handset off, though. * Remove your sim card: While most of the data that you store is kept on your internal storage or microSD card, it's still possible for contacts or call logs to be kept on your sim card. The person you're selling it to has no need for this, so always be sure to remove it. * Remove your microSD card: Similarly, if your phone has a microSD card, chances are you don't really want or need to give it away. To truly ensure that the data on your micro SD card is secure, keep it to yourself. * Erase and format your SD card: If you absolutely have to include your microSD card with your phone, then you'll at least want to erase and format it. You can usually do this via the Settings app. You can also do it by connecting it to a PC, but if you format it with the wrong file system for your phone, it might not recognize the card. Again, though, the best way to secure your data is to keep your card. That being said, for most of the average user's needs, your phone already has the tools built in to securely erase your phone's data. If you carry military secrets around on your unprotected Galaxy S4, well.. for starters, you probably shouldn't. But if you do, you should probably consult someone with a PhD in something before you lose your phone in a bar. Everyone else may continue. When supported iOS devices wipe your phone, what's really happening is that the hardware-specific encryption key is securely wiped. Everything else on your phone is left an unintelligible mess, even if someone were to use a fancy forensics lab to physically examine the memory chips which 99% of you will probably never have to deal with. So what do you need to do to securely erase your phone? Just head to Settings > General > Reset > Erase all Content and Settings. While, ideally, you shouldn't have to overwrite your phone to erase data using a factory reset, if you're unsure or want to be extra safe, encrypting your phone (usually found in Settings under "Security") before wiping it can provide some reassurance. Just be aware that it may be redundant on certain phones. Still, better safe than sorry. 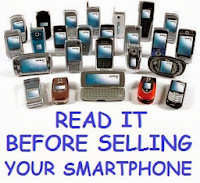 Of course, the last line of defense before you sell your phone is to vet your buyer. If you're using a CDMA device, be sure to deactivate your phone with your carrier before handing it off. And while you're at it, make sure you've taken care of your phone and are selling it for as much as possible.